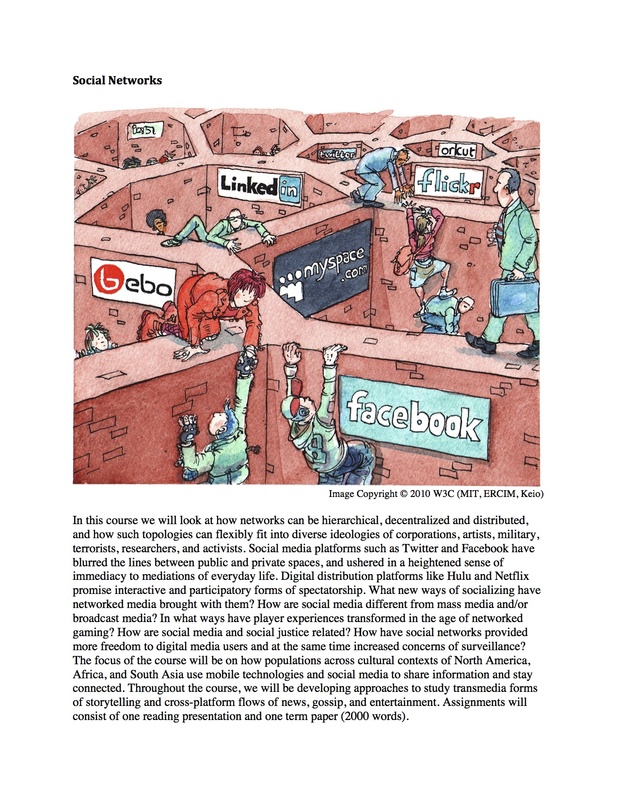 In this course we will look at how networks can be hierarchical, decentralized and distributed, and how such topologies can flexibly fit into diverse ideologies of corporations, artists, military, terrorists, researchers, and activists. Social media platforms such as Twitter and Facebook have blurred the lines between public and private spaces, and ushered in a heightened sense of immediacy to mediations of everyday life. Digital distribution platforms like Hulu and Netflix promise interactive and participatory forms of spectatorship. What new ways of socializing have networked media brought with them? How are social media different from mass media and/or broadcast media? In what ways have player experiences transformed in the age of networked gaming? How are social media and social justice related? How have social networks provided more freedom to digital media users and at the same time increased concerns of surveillance? The focus of the course will be on how populations across cultural contexts of North America, Africa, and South Asia use mobile technologies and social media to share information and stay connected. Throughout the course, we will be developing approaches to study transmedia forms of storytelling and cross-platform flows of news, gossip, and entertainment. Assignments will consist of one reading presentation and one term paper (2000 words).